Northern Exposure Sheets feature randomly place images of bears, moose, pine trees, fish, feathers and other wildlife icons in tones of tan, burgundy, and dark green on a light cream background on the top sheet, the bottom sheet is dark green and cream buffalo plaid and the reversible pillow cases feather a bear on one side and moose on the other. 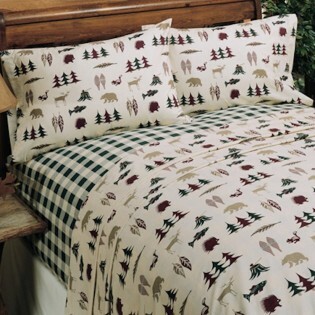 Made in the U.S.A.
Northern Exposure Sheets feature randomly place images of bears, moose, pine trees, fish, feathers and other wildlife icons in tones of tan, burgundy, and dark green on a light cream background on the top sheet, the bottom sheet is dark green and cream buffalo plaid and the reversible pillow cases feather a bear on one side and moose on the other. 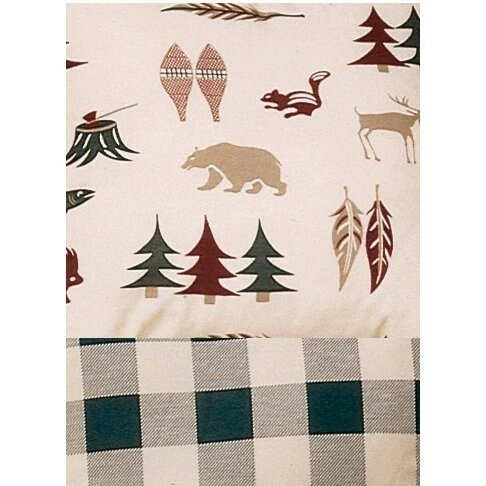 These rustic lodge style sheets are 180 count and made of machine washable poly/cotton percale. Made in the U.S.A. Fits mattresses up to 13" deep.